Industry feedback is shaping the next major release of PCI DSS. Greater frequency of testing of critical controls; for example, incorporating some requirements from the Designated Entities Supplemental Validation (PCI DSS Appendix A3) into regular PCI SS requirements. PCI SSC will also conduct additional RFC periods with PCI SSC stakeholders prior to publication of PCI DSS v4.0. Information about the RFCs will be posted on PCI SSC website, and PCI SSC stakeholders will receive communications with additional information on how to participate. As part of the RFC process, all feedback received will be reviewed and considered in the development of the standard. 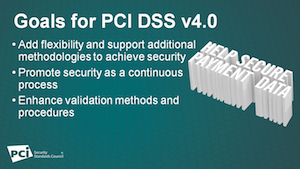 The 12 core PCI DSS requirements are not expected to fundamentally change with PCI DSS v4.0, as these are still the critical foundation for securing payment card data. However, based on feedback received, PCI SSC is evaluating how to evolve the standard to accommodate changes in technology, risk mitigation techniques, and the threat landscape. PCI SSC is also looking at ways to introduce greater flexibility to support organizations using a broad range of controls and methods to meet security objectives. Enhance validation methods and procedures. PCI DSS v4.0 is not anticipated for release prior to late 2020. Specific timing on the release is dependent upon feedback received during the development period. PCI SSC will keep stakeholders updated on timing throughout the process.